Weather conditions are still favorable for launching Felix Baumgartner's space jump try this morning (Oct. 9, 2012). ATA Aerospace along with meteorologist Don Day released a weather balloon this morning resembling a mini version of Felix’s balloon, which carries a radiosonde into the stratosphere to analyze weather conditions over Roswell, NM. This story was updated at 10 a.m. EDT. An Austrian daredevil's attempt to make the highest-ever skydive today (Oct. 9), a freefall expected to reach supersonic speed, has been delayed because of strong winds over New Mexico. Felix Baumgartner is planning to leap from a balloon nearly 23 miles above Roswell, N.M., to break the world record for skydive altitude. 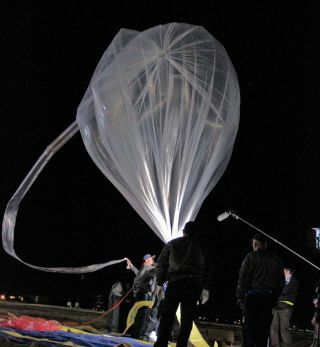 The 55-story balloon was scheduled to launch as early as 6 a.m. MDT (8 a.m. EDT), but now mission planners say the takeoff won't be before 11 a.m. MDT (1 p.m. EDT). Baumgartner's balloon is enormous but fragile, requiring winds below 2 mph (3.2 kph) to launch safely. When he does launch, if all goes according to plan, Baumgartner will plummet to Earth from an altitude of 120,000 feet (36,576 meters) this morning, becoming the first skydiver to break the sound barrier during his 5.5-minute freefall. Over the course of about three hours, the balloon will lift Baumgartner — riding in a custom-built 2,900-pound (1,315 kilograms) capsule — up to the desired altitude. The daredevil is aiming to break a skydiving mark that has stood since U.S. Air Force Capt. Joe Kittinger leapt from 102,800 feet (31,333 m) back in 1960. Kittinger serves as an adviser to Baumgartner's mission. Baumgartner's supersonic leap was originally scheduled for Monday (Oct. 8), but it was postponed because of weather concerns. Baumgartner has been working up to Tuesday's leap in a stepwise fashion. He jumped from 71,581 feet (21,818 m) this past March and then dove from 97,146 feet (29,610 m) on July 25. Red Bull Stratos officials have referred to today's attempt as a jump from the edge of space, but this is perhaps a bit of an exaggeration. Space is generally considered to begin at an altitude of 62 miles (100 kilometers), or about 327,000 feet (though the U.S. Air Force awards astronaut wings to pilots who fly above 50 miles, or 80.5 km).